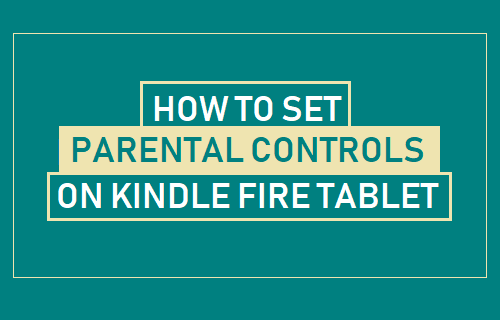 Here is how you can set parental controls on Kindle Fire Tablet and prevent children in your house from being exposed to age in-appropriate content or making unwanted in-app purchases. 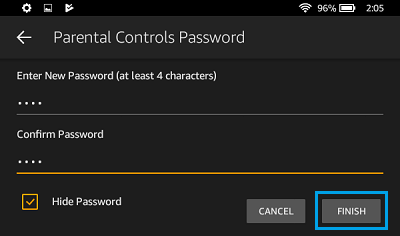 While the Parental Controls feature on Amazon’s Kindle Fire Tablet does not specifically block age in-appropriate content, it can be used to block access to specific services. By default, Parental Control blocks Alexa, Web browser, Email, Contacts and Calendars. It also disables social sharing and password protects Amazon purchases. When Parental Control feature is switched ON, you will see a small Lock icon appearing at the top of the screen of your Kindle Fire Tablet. 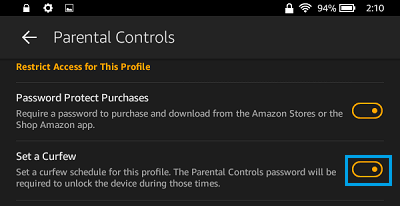 Follow the steps below to set Parental Controls on Kindle Fire Tablet. 1. 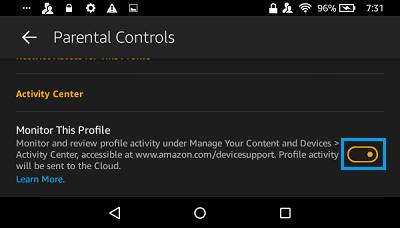 Tap on the Settings Icon located on the Home Screen of your Kindle Fire Tablet. 2. On the Settings screen, scroll down and tap on Parental Controls option located Under “Personal” section. 3. On the Parental Controls screen, set Enable Controls by moving the slider next to Parental Controls to ON position. 4. In case you are setting up parental controls for the first time, you will be prompted to set up a new Parental Control password. Enter a four-digit Password, confirm the Password by typing it again and tap on the Finish button. Note: Parental Control Password is not the same as your Lock screen password. 5. 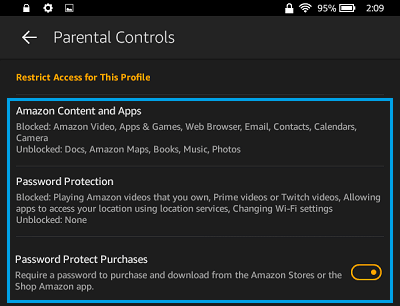 On the Parental Controls screen, you will see Amazon Video, Apps & Games, Web browser, Email, Contacts and Calendar already being blocked by default Parental control settings. Also, Purchases will also be password protected by default Parental Control Settings. 6. The Curfew Schedule option under Parental Controls, allows you to configure days and time periods, during which your children are not allowed to use your Kindle Fire Tablet. To set Curfew, toggle ON the Set a Curfew option located on Parental Controls screen. 7. On the Next screen, you can configure the Days and the Timings for the Curfew. 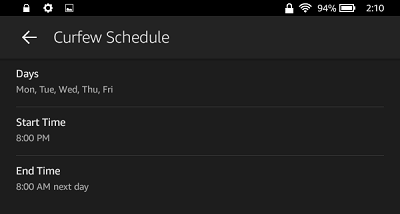 Note: Signing into Kindle Fire during a curfew will disable the curfew. You need to toggle ON the Set Curfew option once again to enable Curfew on your device. 8. Enabling Monitor this Profile option, allows you to view detailed information about Apps, Games, Music, Videos, and Books accessed, and for how long they were viewed. You can access this information by signing into your Amazon account and clicking on Your Content & Devices. Note: Monitor This Profile can only be turned on for the Parent Profile controlling Parental Controls and not for child profiles.